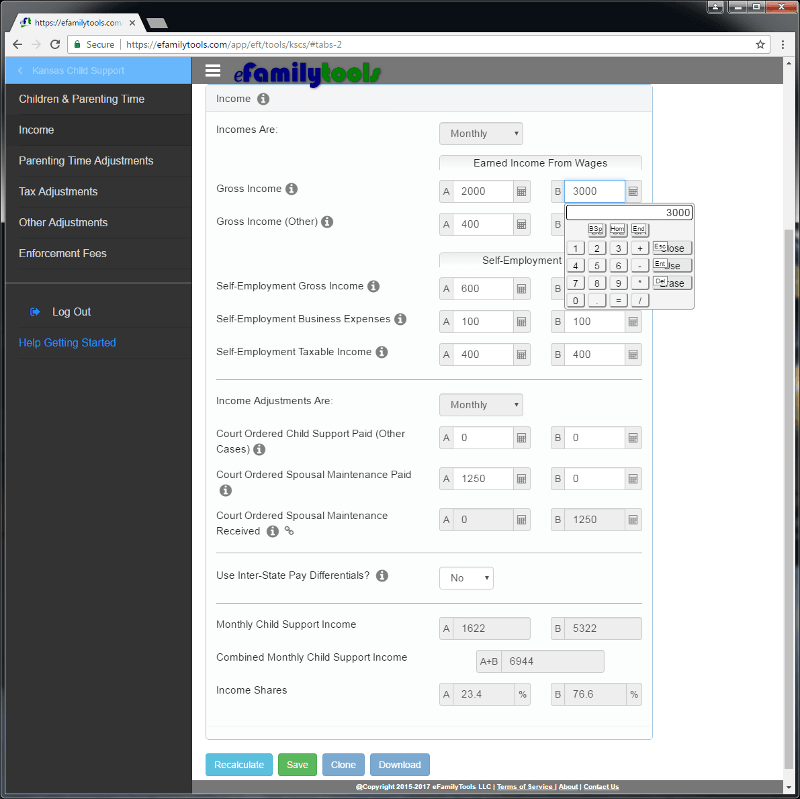 eFamilyTools Kansas Child Support Calculator and Legal Forms Software - Free Version Available! 2019 Updates have been released! 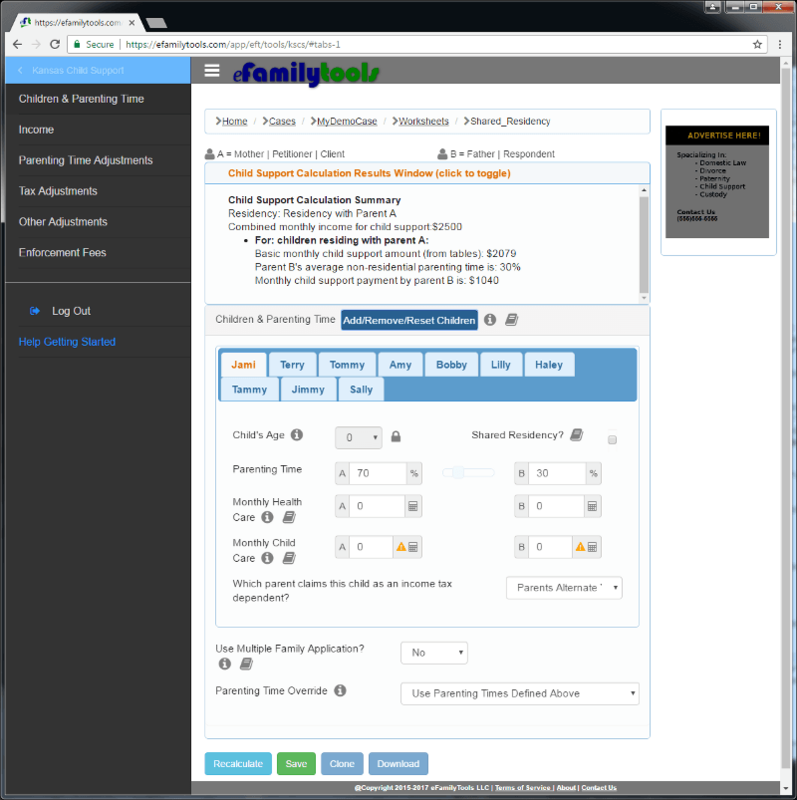 eFamilyTools Kansas child support calculator version 19.0.0 has been released. This new version incorporates all the latest IRS and BLS data. Read more about the changes in our blog post. Check out some of our innovative features. Create as many clients as you like (depends upon license selected). Each client has a case file containing all case information. You are free to name your cases and clients however you like. Cases are sorted by default to show the most recently visited case first. Cases are also searchable for easy access. Scenarios and worksheet updates are a breeze. Create as many as you like. Data entry is easy to use on any platform. 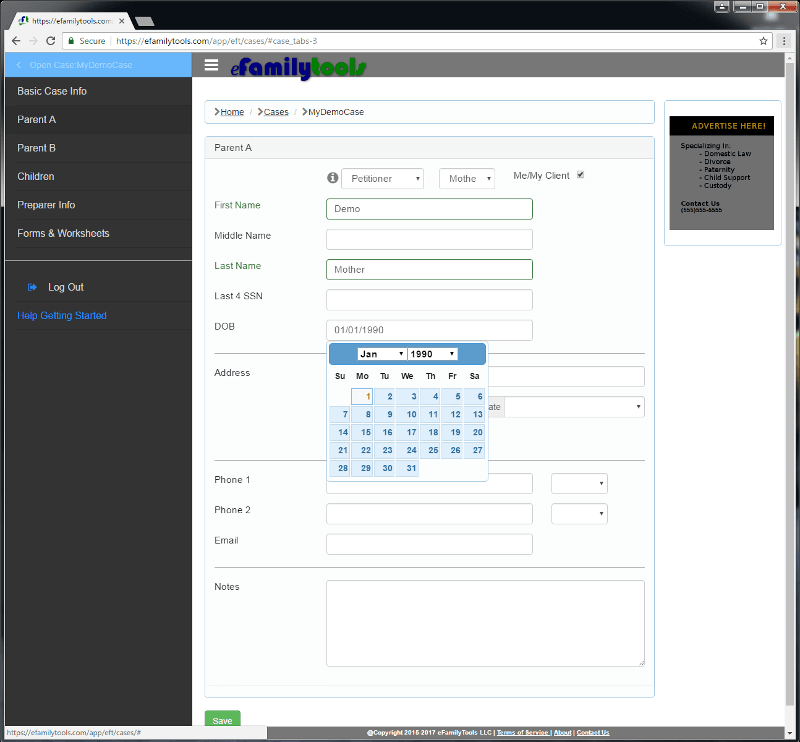 Forms are designed to work seamlessly on mobile devices too. 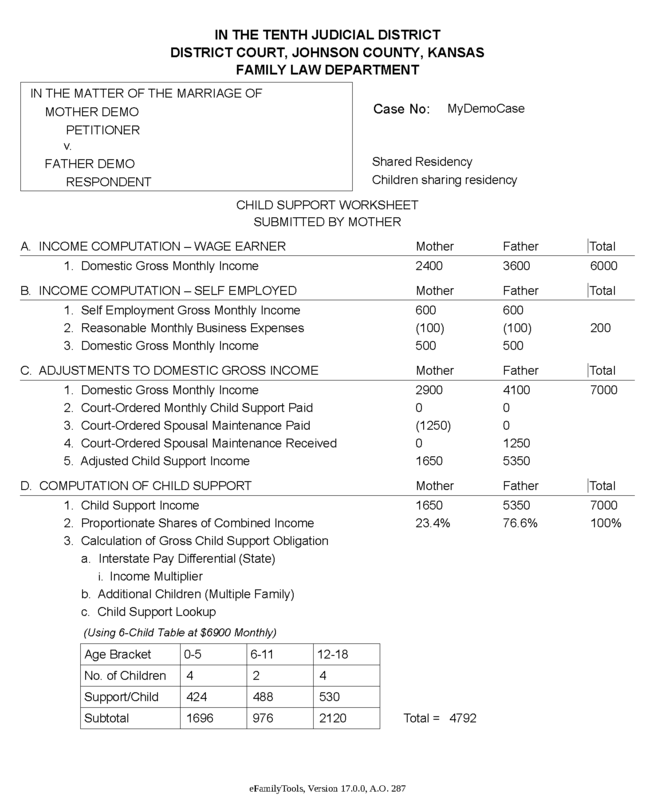 Calculate child support for a family consisting of up to 10 children. 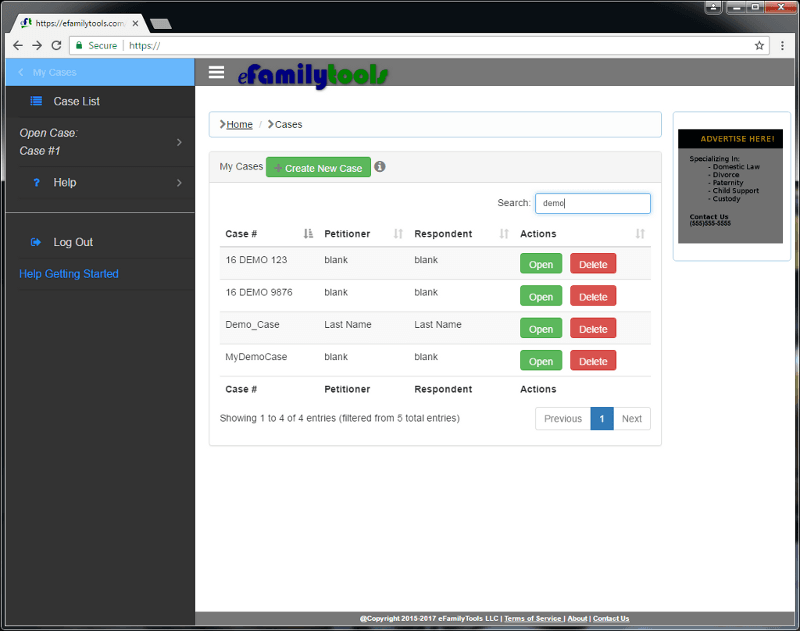 Easy to use tabbed interface to keep you organized as you work. The child support calculation results window provides you with real-time calculations as you type. You are also advised of any potential concerns with your entries. The child support calculation results window provides you with real-time calculations as you type. You are also advised of any potential concerns with your entries. Incomes are entered in an organized intuitive manner. Calculations automatically update as you enter your data. A convenient calculator app is available in each field. The calculator is enabled on-the-fly as you type. Simply type a mathematical operator (+-*/) and the calculator automatically detects your entry and transfers your entry to the calculator app. Calculations such as the applicable marginal tax rate, personal exemption adjustment, and head of household adjustment are calculated simply and easily. The calculator draws data from the case file and the child support worksheet to simplify how you calculate tax adjustments. 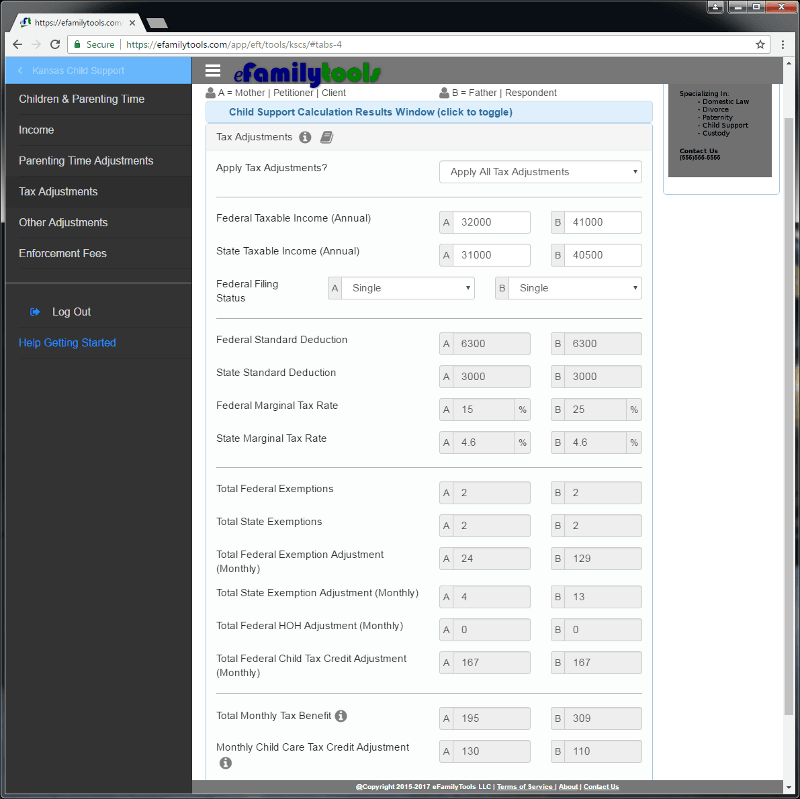 Download Kansas child support worksheets and Equal Parenting Time (EPT) worksheets with a single click. Modern browsers will simply open the PDF file in a new tab avoiding any distraction to your work flow. 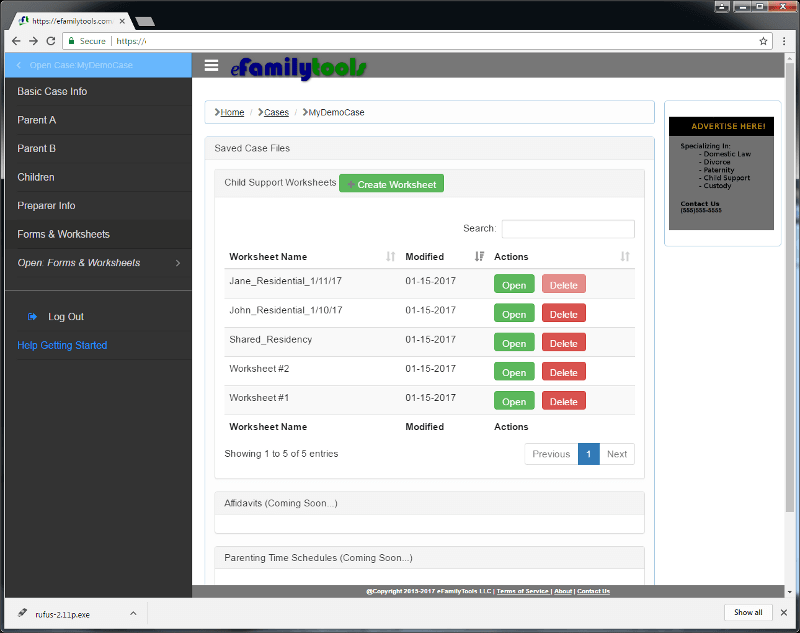 Divided residency cases require no further user action on your part. If the custody parameters are such that more than one work sheet is required, the required number of worksheets are created and compiled to a single document for you. Microsoft Word editable files are also available. These forms look identical to the PDF forms but are in the .doc format for electronic filing with the courts. No software to install. No upgrades or update patches to install or configure. Our software is always up-to-date. Our software was developed for compatibility with any device with a web browser. Take your business with you on any device. Our software is trusted by attorneys and legal professionals across Kansas. Give us a try and you'll see why. Child Support Calculator and More! eFamilyTools is a comprehensive online tool suite that performs calculations and creates legal forms for family law cases. Family law attorneys, legal assistants, court staff, case managers, mediators, and parents alike will find great value in the extensive set of tools we offer. Complex child support calculations, such as interstate pay differentials, parenting time adjustments, tax adjustments, shared residency, divided residency, and more are all handled easily and appropriately. Why not use the official Kansas calculator? The answer is simple, Kansas does not provide an official, state-sponsored, software or website to calculate child support. Kansas only provides the child support guidelines and a worksheet to fill out. For those wanting to automate or expedite Kansas child support calculations, 3rd party software is required most of the time. Our business is based on getting it right the first time and making it easy and affordable for our users.